Good Afternoon fellow bloggers. Feels like i have been away for so long and it has only been a few days. I have not touched a single scrappy thing over the past few days as i have been feeling quite unwell. As it is the start of a new month some new challenges have gone up so i decided to try and get one together. I decided to do the challenge for over at Lets Get Sketchy. The challenge this week is to use white plus one other colour. Having two little girls there is no surprise i chose PINK! I used a Prima mask and some Alcohol Inks then preceded to layer up some bits and pieces. So here is my page. Awesome layout, love the pinks. Such a cute photo! Thanks for playing along at Let's Get Sketchy! Cute layout with lots of nice embellishments. Love the mix of flowers and butterflies. Thank you for playing along with us at LGS! wow! this is fabulous, loving all the PINK and the lovely details, thanks for playing along with us at lgs! 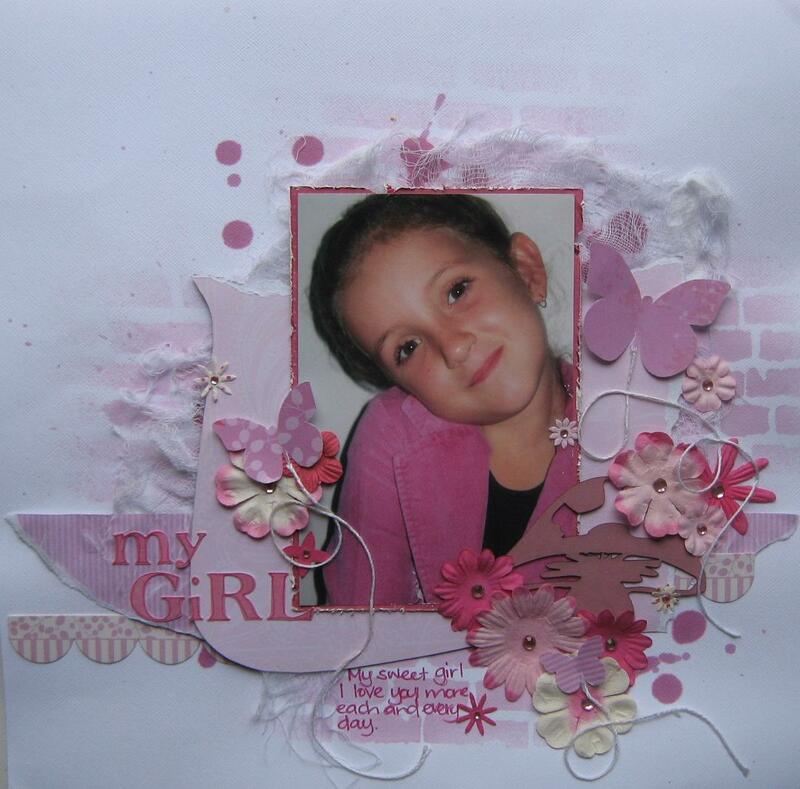 What a sweet page all in pink loved by little girls! I really like the misted brick look & the butterfly trails! love your page, the misted background and all the little bits and pieces work so perfectly together! thanks for playing along with us at LGS! Amazing and awesome layout! Wow, love the pink and white combo on your work! Great job! Thanks for joining the 8th Official Sketch Challenge at Let’s Get Sketchy! Great combo - - I chose pink for mine too! Love your layout - so many great layers & details! Thanks for joining us this week at Let`s Get Sketchy! I love the inking and masking you did with this layout. Along with all the layers, it's just a fabulous combination! Love, love, love the pink and white!!! Thanks for playing along with us at LGS. beautiful! thanks for playing with us at LGS! so cute page!Love the mist,String and many flowers! Thanks for playing along with us at LGS!! This is fantastic!!! Love all the details and the masking looks great! Cute photo! Thanks for joining in the fun at LGS! My two reasons to smile!